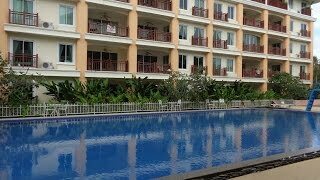 Apartments in Phuket in the new resort area of Nai Harn. Featuring: large communal swimming pool, Parking, children's Playground, tennis courts, restaurant, satvas. One double bedroom with king size bed. The new layout, beautiful furnishings: bedside cabinets with lamps,wardrobe, dressing table with mirror, plasma TV with Russian channels. Decorated with paintings, vases, figurines, etc. The bathroom with shower. Large lounge with soft leather sofa, coffee table, large plasma TV with Russian channels. the Euro kitchen: kitchen set, electric hobs, extractor, oven, microwave, kettle, crockery, big refrigerator, dining table with chairs. Balcony with outdoor furniture, sun loungers. 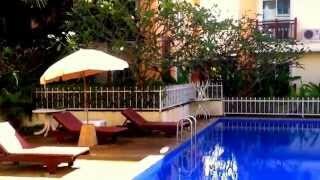 a Big beautiful pool with sun loungers and parasols, a children's slide. The complex is a restaurant, a small artificial lake, green area, Playground. Located in Rawai Beach, Palm Breeze Residence offers an outdoor pool and a restaurant. This self-catering accommodation features WiFi. The property is 1.3 km from Phuket Seashell Museum. Tesco Lotus at Park Rawai is 3.2 km away, while Promthep Cape is 4 km from the property. Offering on-site parking, it is 35 km from Phuket Airport. The apartment will provide you with a fully-equipped kitchen, a dining area and a balcony. Other amenities include a TV, air conditioning and a sofa seating area. Shower facilities are in an en suite bathroom. At Palm Breeze Residence you will find a tennis court and a fitness centre. Other facilities like a vending machine are offered. Activities in the surrounding area include mini golf.